The 7500-Wing Dual LCD Monitor Arm Mount allows for quick and easy monitor adjustment. This dual monitor mount features our convenient, adjustable wing bracket and a spring-assist tilter provides independent rotation and effortless monitor motion. The included FLEXmount™ allows for various options to mount the monitors on your desk or the wall. The 7500-Wing dual computer monitor arm floats both monitors above the desk for a space saving design. 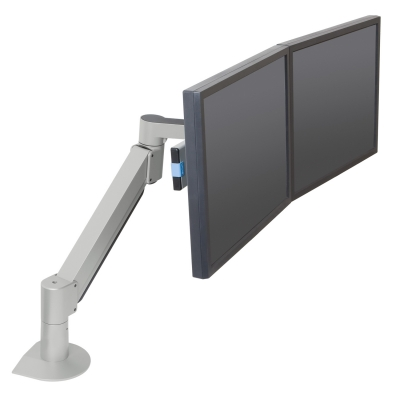 Monitor mounting arm can position monitors horizontally (side-by-side) or vertically (stacked one over the other). Monitors can be independently rotated. Quick-install/quick-release mechanism instantly and securely snaps monitors into position on the monitor arm. The dual LCD monitor mount accomodates most monitors up to a 24"-wide screen (monitors cannot exceed weight capacity of monitor arm). Monitor arm has an 18" vertical range and a 28" horizontal range. The adjustable monitor mount rotates 360 degrees at three joints. VESA-monitor compatible (75mm and 10mm VESA adapters included). 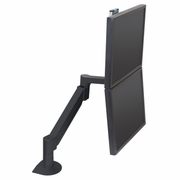 Includes FLEXmount™ with six mounting options. Internal cable management to conceal cables in the monitor arm.